August Carlsson was born on 28 October 1853 at Skaraborg, Sweden. He was the son of Karl Larsson and Charlotta Andersdotter. August Carlsson died on 14 December 1853 at Atterud Back, Skaraborg, Sweden. Anna Larsdotter was born circa 1817. She was the daughter of Lars Larsson and Ingrid Andersdotter. Lars Larsson was born circa 1821. He was the son of Lars Larsson and Ingrid Andersdotter. Maria Larsdotter was born circa 1828. Johanna Larsdotter was born circa 1830. Lars Eriksson was the son of Erik Jonsson and Christin Carlsdotter. Jonas Eriksson was the son of Erik Jonsson and Christin Carlsdotter. Married Name 10 July 1935 As of 10 July 1935,her married name was Jaynes. Married Name 20 May 1939 As of 20 May 1939,her married name was Madill. Married Name 6 November 1960 As of 6 November 1960,her married name was Nelson. Ethel Beatrice Carlson was born on 14 January 1908 at Charles Mix, South Dakota. She was the daughter of Oscar Martin Carlson and Margaret Jane Moles. Ethel Beatrice Carlson married Leon Jaynes on 10 July 1935 at South Dakota. Ethel Beatrice Carlson married George Madill on 20 May 1939 at Black Hills, South Dakota. Ethel Beatrice Carlson married Raymond Nelson on 6 November 1960 at Burlington, Iowa. Ethel Beatrice Carlson died on 2 October 1973 at Burlington, Iowa, at age 65. [S243] U.S. Federal Census 1920 U.S. Federal Census, by Ancestry.com, ED207. Dwelling 217. [S250] U.S. Federal Census 1930 U.S. Federal Census, by Ancestry.com, ED62-17. Dwelling 4. Leon Jaynes was born circa 1914. He married Ethel Beatrice Carlson, daughter of Oscar Martin Carlson and Margaret Jane Moles, on 10 July 1935 at South Dakota. Leon Jaynes died on 26 October 1935 at Black Hills, South Dakota. George Madill was born circa 1883. He married Ethel Beatrice Carlson, daughter of Oscar Martin Carlson and Margaret Jane Moles, on 20 May 1939 at Black Hills, South Dakota. George Madill died on 26 May 1953 at Black Hills, South Dakota. Raymond Nelson was born on 23 December 1902. He married Ethel Beatrice Carlson, daughter of Oscar Martin Carlson and Margaret Jane Moles, on 6 November 1960 at Burlington, Iowa. Raymond Nelson died on 10 September 2002 at Clinton, Iowa, at age 99. Cecil Martin Carlson was born on 2 January 1910 at Charles Mix, South Dakota. He was the son of Oscar Martin Carlson and Margaret Jane Moles. Cecil Martin Carlson married Margaret Elizabeth Jackson, daughter of Henry Jackson and Vera Kenaston, on 2 June 1936 at Methodist Church, Ainsworth, Nebraska. Cecil Martin Carlson died on 7 December 1981 at in ambulance, near O'Neill, Nebraska, at age 71. Married Name 25 May 1944 As of 25 May 1944,her married name was Miller. Married Name 15 September 1979 As of 15 September 1979,her married name was Elsbury. Inez Carlotta Carlson was born on 2 August 1912 at near Wewela, Tripp, South Dakota. Inez Carlotta Carlson married Percy V. Miller, son of Don R. Miller and Hazel B. (? ), on 25 May 1944 at at the home of Oscar and Margaret Carlson, Jackson, Iowa. Inez Carlotta Carlson married Wallace A. Elsbury, son of William Elsbury and Minnie Brigman, on 15 September 1979 at Maquoketa, Jackson, Iowa. Inez Carlotta Carlson died on 17 January 2013 at Clinton, Iowa, at age 100 Inez Carlotta Carlson-Miller-Elsbury passed away on Thursday, January 17, 2013, at Mercy Living Center South in Clinton, Iowa, at the age of one- hundred years-five months. Inez Carlotta Carlson was born August 2, 1912, in a sod house near Wewela, Tripp County, South Dakota. In the early 1900’s her parents, Oscar M. Carlson and Margaret J. Moles Carlson, had homesteaded a quarter section of land in Tripp County. Inez was the third of nine children with five brothers and two sisters. She attended high school in Colome, South Dakota, and was able to obtain a teaching certificate with that education. She taught in numerous one room country schools in both South Dakota and Iowa, following her parents when they moved from their homestead to a small farm north of Maquoketa in Jackson County. She finished her teaching career at Andrew Community Schools retiring in 1977, having taught there for over twenty years. Inez always believed in and stressed the value of a good education and throughout her teaching career she took night courses to keep her teaching certificate up to date. During summer vacations she enrolled in courses at Mount St. Clare College in Clinton. She finally realized her dream and received her Bachelors of Science degree in education from Upper Iowa University in Fayette in the summer of 1970. On May 25, 1944, she married Percy Miller, a Sand Prairie farmer (and later an electrician for Stickley Electric), in the living room of her parents’ rural home. Inez is survived by three children born to this union: Joel Miller and his wife, Diane, of Delavan, Wisconsin; Ronald Miller and his wife, Leanna, of Crystal Lake, Illinois; and Penny Royer and her husband, Dwight, of Clinton, Iowa. Her husband, Percy, preceded her in death on February 2, 1970. Inez is also survived by one sister, Margaret Reed of rural Spragueville; seven grandchildren; eleven great-grandchildren; and numerous nieces and nephews. On September 15, 1979, she married Wallace Elsbury in Maquoketa, Iowa. He preceded her in death in 1997. Inez was a longtime resident of Clinton having lived for a number of years at Sarah Harding Retirement Home, Bickford Cottage assisted living and finally — Mercy Living Center South. Inez was an avid reader and enjoyed playing cards while at Mercy South. Her family surprised her with many guests (family and friends) at a celebration of her one-hundredth birthday in July of 2012. She was a member of the First Congregational United Church of Christ of Clinton. Funeral services will be 11 a.m. Wednesday, January 23, 2013, at the First Congregational Church with visitation from 10 a.m. to the service hour. She will be laid to eternal rest alongside the love of her life, Percy, at the Andrew Cemetery, Andrew, Iowa. Serving as pallbearers will be Todd Royer, Eric Royer, Ryan Royer, Brian Miller, Mark Reed, David Reed and Joshua Flannigan. Memorials can be made to the First Congregational Church, Clinton. The Clinton Chapel Snell-Zornig Funeral Homes & Crematory is in charge of arrangements. She was buried after 17 January 2013 at Andrew Cemetery, Andrew, Jackson, Iowa. Married Name 14 February 1937 As of 14 February 1937,her married name was Stephenson. Gaynell Irene Carlson was born on 1 December 1913 at near Wewela, Tripp, South Dakota. Gaynell Irene Carlson married Edward Wynne Stephenson on 14 February 1937 at Trenton, Missouri. Gaynell Irene Carlson died on 11 December 1996 at Traverse City, Michigan, at age 83. Wayne Fillmore Carlson was born on 15 February 1916 at near Wewela, Tripp, South Dakota. Wayne Fillmore Carlson married Roma Thelma Virginia Lee on 2 November 1934 at Winner, South Dakota. Wayne Fillmore Carlson died on 7 February 1967 at car accident 4 miles from home at age 50. Wallace Edward Carlson was born on 5 February 1919 at near Wewela, Tripp, South Dakota. Wallace Edward Carlson married Emma Morrison Willomy on 16 December 1942 at Kahoka, Missouri. Wallace Edward Carlson married Mildred Baldwin on 5 February 1965. Wallace Edward Carlson died on 13 March 1981 at Phoenix, Arizona, at age 62. Howard Allen Carlson was born on 14 September 1921 at near Wewela, Tripp, South Dakota. Howard Allen Carlson married Frances Mary Whitsitt on 22 June 1947 at Burlington, Iowa. Howard Allen Carlson died on 1 July 1982 at Ann Arbor, Michigan, at age 60. Married Name 22 June 1947 As of 22 June 1947,her married name was Carlson. Frances Mary Whitsitt was born on 7 May 1912 at Howard, Kansas. She married Howard Allen Carlson, son of Oscar Martin Carlson and Margaret Jane Moles, on 22 June 1947 at Burlington, Iowa. Frances Mary Whitsitt died on 21 November 2001 at Oak Brook, Illinois, at age 89. Victor Maurice Carlson was born on 30 August 1924 at near Wewela, Tripp, South Dakota. Victor Maurice Carlson died on 10 September 1999 at Davenport, Iowa, at age 75. Name Variation Frank Shultz Paddock was also known as Paddock. Frank Shultz Paddock was born on 2 November 1862 at West Point, Columbia, Wisconsin. He was the son of John Barney Shultz and Theresa Amelia Walker. Frank Shultz Paddock married Marie Josephine Carlson, daughter of Anders Gustav Carlsson and Johanna Gustafsdotter, on 19 April 1905 at Geddes, Charles Mix, South Dakota. [S323] Washington Death Index, 1940-1996 (published). [S244] U.S. Federal Census 1910 U.S. Federal Census, by Ancestry.com, ED93. Dwelling 122. [S243] U.S. Federal Census 1920 U.S. Federal Census, by Ancestry.com, ED44. Dwelling 97. [S250] U.S. Federal Census 1930 U.S. Federal Census, by Ancestry.com, ED12-8. Dwelling 22. Addie E. Paddock was born on 27 January 1906 at Geddes, Charles Mix, South Dakota. She was the daughter of Frank Shultz Paddock and Marie Josephine Carlson. Addie E. Paddock died in 1907 at Geddes, Charles Mix, South Dakota. Married Name 9 August 1933 As of 9 August 1933,her married name was Parish. Edith Josephine Paddock was born on 15 January 1908 at Geddes, Charles Mix, South Dakota. Edith Josephine Paddock died on 9 December 2006 at age 98 Edith Parish struggled long and gracefully against the cruelty of Alzheimer's disease and passed away peacefully on December 9, 2006. Edith was born Jan. 15, 1908 in Geddes, South Dakota, the daughter of Frank and Marie Paddock. Edith was raised and received her formal education in Geddes and taught at various schools in the area as well as on the Sioux Indian Reservation. In 1933, she married Verlynne Parish of Academy, South Dakota and they moved to Selah, WA where they lived the majority of their life. During the war years (1941-1945) they lived in Seattle while Vern worked for the Boeing Company. When they returned to Selah, they purchased an orchard and operated it for 40 years. During that time, Edith spent many years employed at various fruit companies. She was a longtime member of the Selah Heights Grange, joining in 1947. She received her 50 year pin in 1997. At the time of her death, Edith was the longest living member of the Selah Methodist Church. She enjoyed the friendships and fellowship that developed during this time. She loved her church family and spent many hours working on church projects. She enjoyed making and sharing apple pies. She loved to sew, knit, crochet and make cross stitch pillow cases, making many items for the church bazaars. For relaxation she enjoyed camping, fishing, picking morel mushrooms and going on picnics with her family. She is survived by her caring husband of 73 years, Vern, of Selah; son, Richard (Joann) of Mukilteo, WA; daughter, Anita Johansen of Woodinville, WA; four grandchildren and five great-grandchildren and numerous nieces and nephews. She will be deeply missed by all whose lives she touched. Funeral Services will be at 11:00 a.m. on Saturday, December 16, 2006 at Keith & Keith 9th Ave Chapel. Interment will follow at Terrace Heights Memorial Park. Visitation will be on Friday from 4:00 p.m. until 8:00 p.m. at the funeral home. Memorials may be made to Selah Methodist Church or the Alzheimer's Research Fund c/o Keith & Keith Funeral Home 902 W. Yakima Ave, Yakima, WA 98902. She was buried on 16 December 2006 at Terrace Heights Memorial Park, Yakima, Yakima, Washington. Royal John Paddock was born on 24 October 1910 at South Dakota. He was the son of Frank Shultz Paddock and Marie Josephine Carlson. Royal John Paddock died on 12 December 1968 at age 58. Royal John Paddock obtained US Social Security Card at Washington; last residence Spokane, Spokane, Washington. In March 1944 at U.S. World War II Army Enlistment, Yakima, Washington, single, no dependents. Married Name 11 August 1934 As of 11 August 1934,her married name was Mugaas. Married Name 2 July 1941 As of 2 July 1941,her married name was George. Married Name 1970 As of 1970,her married name was Pingry. Mildred M. Paddock was born on 22 December 1912 at Wewela, Tripp, South Dakota. Mildred M. Paddock married Lawrence A. Mugaas, son of Knute Mugaas and Dora B. (? ), on 11 August 1934. 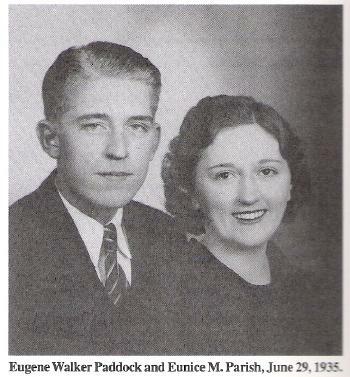 Mildred M. Paddock married Ralph George on 2 July 1941. 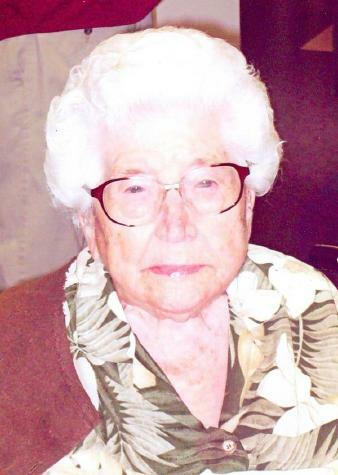 Mildred M. Paddock died on 1 April 2003 at Yakima, Washington, at age 90. She was buried after 1 April 2003 at Yakima, Washington. 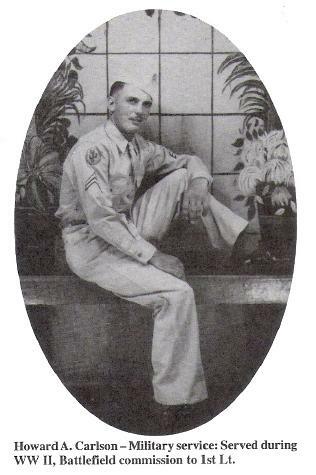 Eugene Walker Paddock was born on 15 May 1915 at Wewela, Tripp, South Dakota. Eugene Walker Paddock married Eunice Merle Parish, daughter of Alton Raymond Parish and Jessie M. Smith, on 29 June 1935 at Yakima, Washington. Eugene Walker Paddock died on 6 September 1973 at Yakima, Washington, at age 58. He was buried after 6 September 1973 at West Hills Memorial Park, Yakima, Yakima, Washington. Eugene Walker Paddock obtained US Social Security Card at Washington; last residence Selah, Yakima, Washington. Married Name 8 September 1920 As of 8 September 1920,her married name was Carlson. Tilda Oakland was born on 12 January 1890 at Douglas, South Dakota. She was the daughter of Andrew Oakland and Gurina Olsdatter Skothein. Tilda Oakland died on 11 October 1966 at Armour Hospital, Armour, Douglas, South Dakota, at age 76. She was buried on 14 October 1966 at Ebenezer Lutheran Church, South Dakota. 1935 Holland ward 4, Douglas, South Dakota Tilda Oakland appeared on the census of 1935 in the household of John Verner Carlson at Holland ward 4, Douglas, South Dakota. Tilda Oakland obtained US Social Security Card at South Dakota; last residence Corsica, Douglas, South Dakota. [S245] U.S. Federal Census 1900 U.S. Federal Census, by Ancestry.com, ED138. Dwelling 46. [S244] U.S. Federal Census 1910 U.S. Federal Census, by Ancestry.com, ED171. Dwelling 45. [S243] U.S. Federal Census 1920 U.S. Federal Census, by Ancestry.com, ED85. Dwelling 132. [S250] U.S. Federal Census 1930 U.S. Federal Census, by Ancestry.com, ED22-10. Dwelling 52. Name Variation Theodore Vernon Carlson was also known as Ted. Theodore Vernon Carlson was born on 2 July 1921 at Douglas, South Dakota. He was the son of John Verner Carlson and Tilda Oakland. Theodore Vernon Carlson married Edna Elizabeth Billups, daughter of Arthur J. Billups and Florence W. (? ), on 2 August 1944 at Dayton, Ohio. Theodore Vernon Carlson died on 14 November 2007 at age 86 Theodore V. "Ted" Carlson, 86, Mitchell, formerly of Stickney, died Wednesday, Nov. 14, 2007, at Avera Queen of Peace Hospital, Mitchell. 1935 Holland ward 4, Douglas, South Dakota Theodore Vernon Carlson appeared on the census of 1935 in the household of John Verner Carlson at Holland ward 4, Douglas, South Dakota. Release Date: 24 Mar 1946. Theodore Vernon Carlson obtained US Social Security Card at South Dakota; last residence Mitchell, Davison, South Dakota. Married Name 2 August 1944 As of 2 August 1944,her married name was Carlson. Edna Elizabeth Billups was born on 18 June 1923 at Aurora, South Dakota. She was the daughter of Arthur J. Billups and Florence W. (?). Edna Elizabeth Billups married Theodore Vernon Carlson, son of John Verner Carlson and Tilda Oakland, on 2 August 1944 at Dayton, Ohio. Edna Elizabeth Billups died on 25 March 1989 at Casa Grande, Arizona, at age 65. [S250] U.S. Federal Census 1930 U.S. Federal Census, by Ancestry.com, ED20. Dwelling 14. Marvin Gustaf Carlson married Valerie (?). Marvin Gustaf Carlson was born on 11 December 1924 at Douglas, South Dakota. Marvin Gustaf Carlson died on 27 March 1985 at Parker, Arizona, at age 60. 1935 Holland ward 4, Douglas, South Dakota Marvin Gustaf Carlson appeared on the census of 1935 in the household of John Verner Carlson at Holland ward 4, Douglas, South Dakota. Naome Leona Carlson was born on 21 November 1926 at Douglas, South Dakota. She was the daughter of John Verner Carlson and Tilda Oakland. Naome Leona Carlson died in March 1928 at Douglas, South Dakota, at age 1.